The DMZ was an interactive installation which confronted participants with a glimpse into the oppression and control of the surveillance state. The installation was made for an immersive theater production / private interactive event put on by Take3 Presents. The DMZ was part of the theatrical staging of a dystopian political convention put on in a 20,000 square foot warehouse venue. 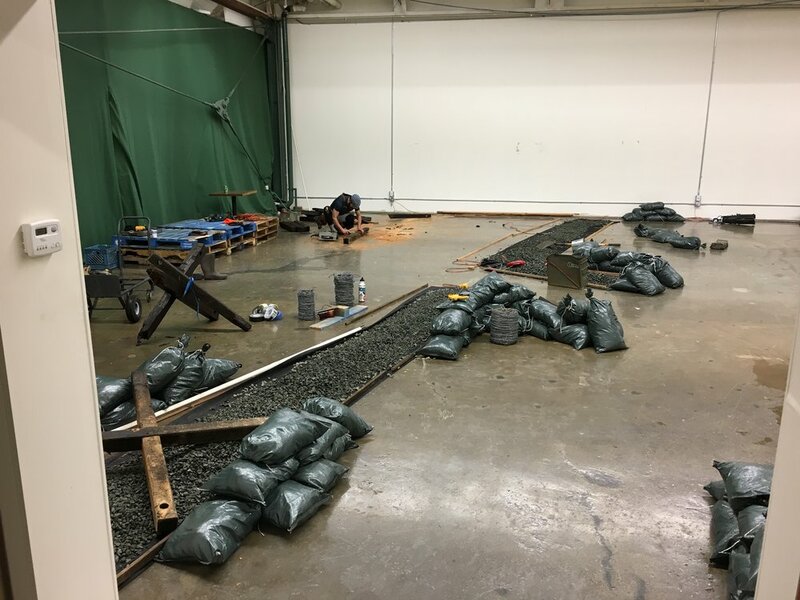 The DMZ occupied a 50 by 70 foot room divided along a diagonal with a military barricade made of gravel, sandbags, Chevaux de Frise and tangled barbed wire. 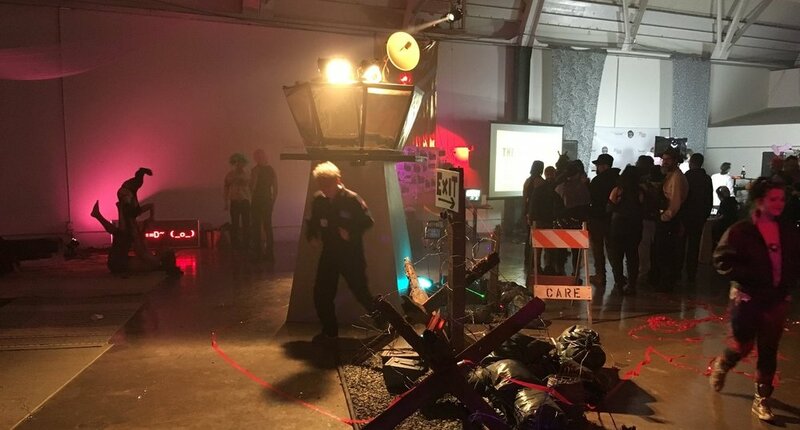 The single crossing point between the two sides was guarded by an eight foot hexagonal guard tower and a net of laser beams made visible by fog machines. Breaking a certain laser beam caused a full alarm response from the tower: flood lights clicked on, a camera and flash went off, and a fire alarm bell rang. The trespassing participant was photographed through a one way mirror in the top of the tower, the photo was added to a wanted person flyer template, automatically printed and dispensed at the base of a bulletin board across the room. The flyers with photos of trespassers were then picked up, stapled to the cork board and annotated by by-standing participants of the event, who had witnessed the trespassing. 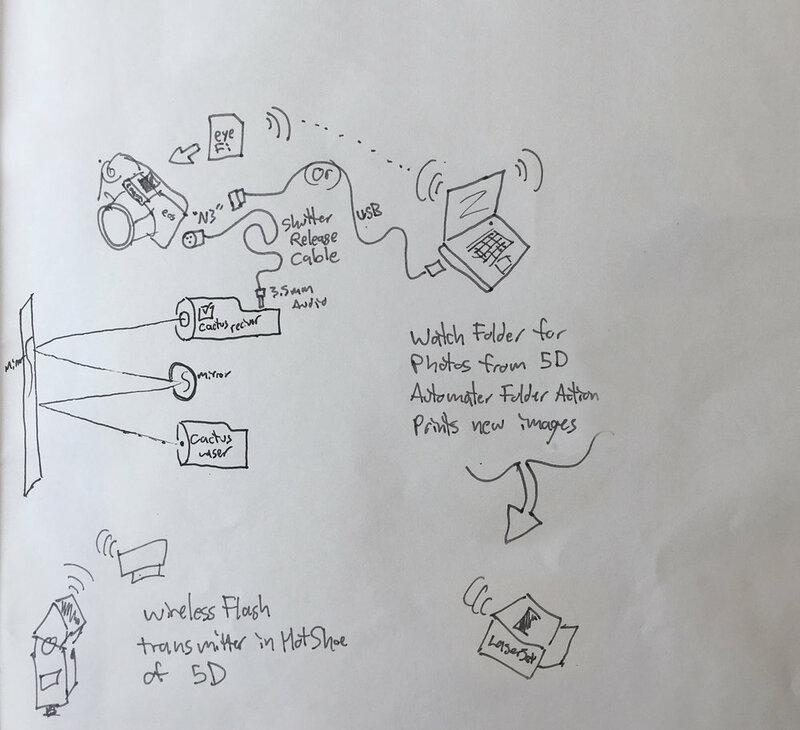 The project makes use of laser camera triggers, wireless flashes, disassembled darkroom light timers, 12vDC relay controls for 120v outlets, computer scripts for watch folders and automatic printing and theatrical prop construction.